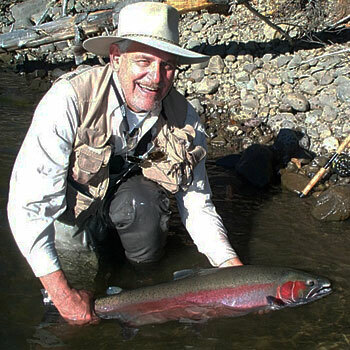 Eric Pettine has been fly fishing for 55 years and fly tying for more than 42 years. He's guided and hosted fly fishing trips from the North Platte in Wyoming to New Zealand, including British Columbia, the United Kingdom, and Chile. Eric has spent most of his life and money on fishing but he has also found time to give back to the industry by teaching others about fly fishing. He has lectured and demonstrated fly tying for the International Sportsman's Exhibition for 23 years and the Federation of Fly Fishers Conclave for 31 years. Eric Pettine starting fly fishing long before strike indicators entered the scene and developed his nymphing techniques based upon close attention to the habits of trout. Eric shares his secrets and details his shallow, medium depth and deep water techniques including leader, tippet, weight and fly selection. He's a member of Joan Whitlock's speakers bureau and was a member of the Chevy Trucks "Pro Team" of outdoor personalities which involved doing six videos, two television fly fishing ads and five hard copy ads for all the major outdoor magazines. He's also written a bi-weekly column on fly fishing for the Coloradoan for over four years, contributed articles to all the major fly fishing magazines and authored two books The North Platte River Journal and River Wrecks. Join Us on Our Next LIVE Broadcast! Enter your information to get notified of our upcoming information packed interviews. Copyright © 2019 Ask About Fly Fishing | As an Amazon Associate we earn from qualifying purchases through links from this website.